If Earth Conservation is a family value, here are some easy steps you can take to get the whole family involved. Children as young as preschoolers can learn to reduce, reuse and recycle. Start early in order to teach kids that they can have an impact in the stewardship of our planet! Even pre-readers can learn to sort recyclables into color-coded bins. Enlist their help in decorating the bins themselves with pictures of cans, plastics and papers. 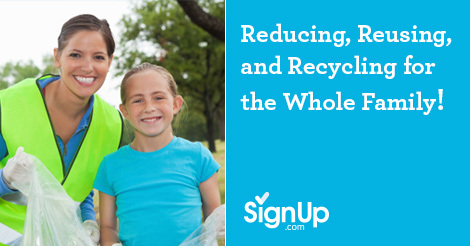 As a family outing, participate in a park clean-up day, or if none exists, organize a neighborhood-wide event using SignUp.com. Create a free SignUp listing clean up times, supplies and refreshments needed. SignUp sends automatic reminders and provides real-time eCalendar syncing. On the big day, simply take advantage of the teachable moment to help your younger kids gather trash and deposit in the proper bins. Older children can take charge of the refreshment station or handing out trash bags. SignUp.com even helps send out thank-yous after the event is over! If you have a local recycling center, take your family for a tour. Most recycling plants offer informational tours as part of their outreach efforts. There, families can learn about the direct impact of recycling, and also the cost to the planet and wildlife when people don’t choose to participate. If no such center is local, try watching YouTube videos with your kids about recycling centers. Or take a trip to the nearest landfill so the family can see how much stuff gets thrown away. Kids are eager to help when they can see the direct impact of their actions! Brainstorm ideas as a family on ways you can cut down on the use of disposables. Switch to cloth napkins, refillable water bottles, digital subscriptions of newspapers and magazines –all of these reduce your carbon footprint as a family. Consider establishing a compost pile. It’s surprisingly easy, requiring only a little bit of space. (Even apartment dwellers can do it!) Use a bin for something contained and more aesthetically pleasing, or freestyle it by creating a heap in an out of the way corner of your yard. Layer grass clippings, cardboard, untreated paper and vegetable and fruit scraps using a 2:1 ratio of brown to green elements. Add water and turn periodically. Cover with a tarp in the fall and winter so the compost continues to cook and reap the benefits in the spring when you plant your vegetable garden and have this delightful fuel for your tomatoes! Use your favorite search engine for step-by-step guides. If your kids’ school uses disposable plates at lunch rather than dishes and trays that need to be washed, you have a huge impact on the environment by packing lunches in reusable containers. Enlist the help of your kids in planning and packing food they will eat. One last meaningful way to lessen your family’s impact on the environment is to do away with the use of plastic bags. Whether it’s in the preparation of school lunches or the daily shopping, use alternatives such a reusable shopping bags and lunch containers. These small changes can have a huge impact on the amount of trash your family adds to the landfill. And getting your children involved from the time they are small helps ensure that they will grow up to be environmentally conscious!